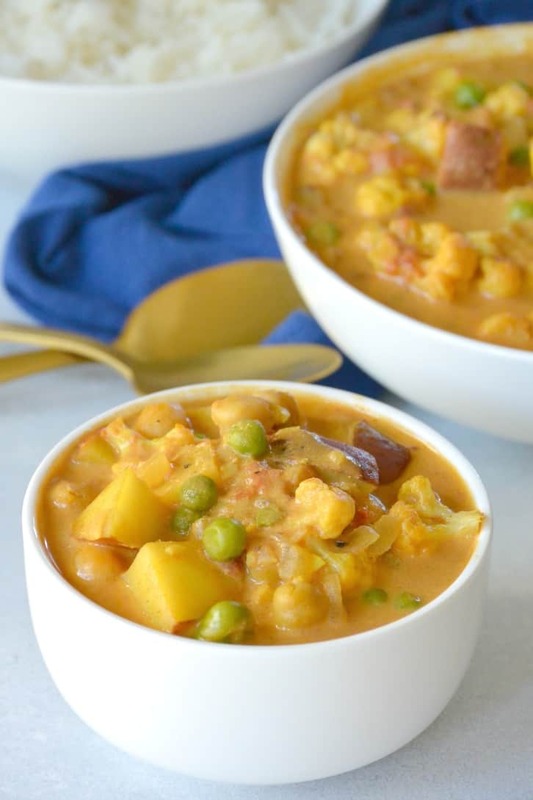 Chickpea Curry (vegan and gluten-free) is made with cauliflower, potatoes, tomatoes, and onion. It’s one of many delicious and easy affordable recipes from Frugal Vegan. Chickpea Curry is such a flavorful meal! It’s surprisingly easy to make, too. I love how it’s loaded with healthy vegetables. Have you tried making curry at home? You may be used to seeing restaurant versions that are really spicy and contain ghee and dairy. 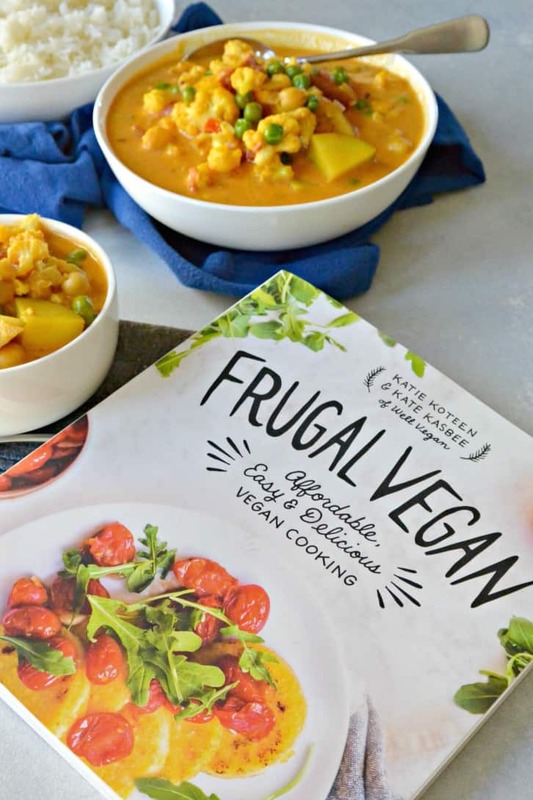 But this version of Chickpea Curry from the amazing cookbook Frugal Vegan by Katie Koteen and Kate Kasbee is so easy to make! All you need to do is saute some onion, add garlic and curry powder (which is flavorful, but not spicy), throw in all the veggies and some liquid, then let it simmer. And if you’re like me, you’ll want to add in the optional coconut milk to make it nice and creamy. I was really happy to see this recipe includes cauliflower. I usually cook it in the oven for dishes such as Roasted Cauliflower with Jalapeno and Lime and Buffalo Cauliflower Bites Salad. 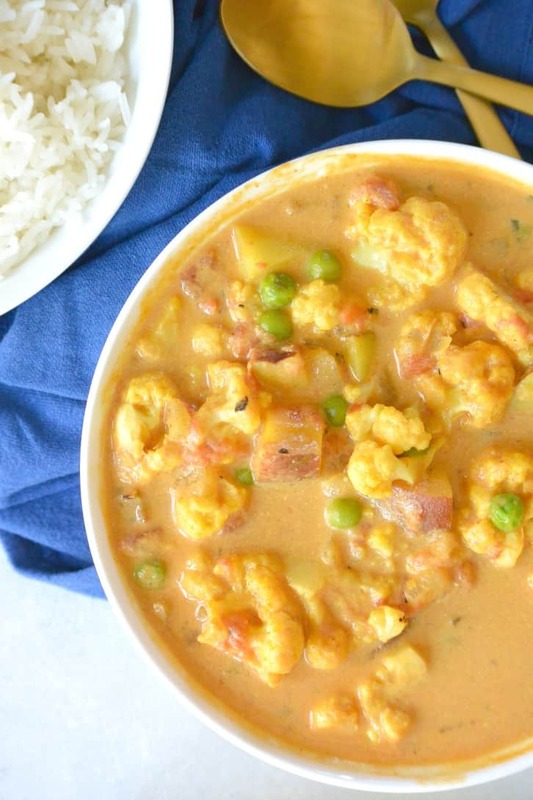 But seeing the ingredients for this curry reminded me how wonderful it is in soups and stews. And did you know that cauliflower is loaded with potassium, vitamin C, vitamin B-6, magnesium, and calcium? In addition, it’s low in carbohydrates yet high in fiber and protein. Plus it tastes great! What are you favorite ways to enjoy cauliflower? And you probably guessed by now that I absolutely love chickpeas (garbanzo beans)! But I usually use them in salads like Tropical Chickpea Salad, Vegan Tuna Salad, and Middle Eastern Bean Salad (Balela), so it’s nice to use them in an entirely different application like curry. Besides showcasing a wide variety of flavors, I love how this cookbook makes all the recipes affordable by indicating which ingredients are an optional splurge. And the photography is beautiful. I get hungry every time I look through the book! 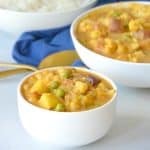 Now let’s make Chickpea Curry from Frugal Vegan! We love, love, love all of the curries. We could eat it every day. And if not curry, then Mexican. Mexican food is pretty awesome, too. But back to curries. One-pot curries are always a quick, healthy and easy dinner option to master. Experiment with different curry varieties and brands until you find one you’re really into. This chickpea curry is fabulous on its own, but you can also serve it over rice or with a side of steamed kale to make it a heartier meal. Heat the olive oil in a Dutch oven or medium saucepan over medium heat. Add the onion and cook until very soft and just starting to brown, about 12 to 15 minutes. Add the garlic and cook for about a minute before adding the curry and bay leaf. Cook for another 30 seconds. Then add the cauliflower, potatoes, crushed tomatoes, chickpeas and vegetable stock. Bring to a simmer, lower the heat and continue to simmer gently for about 20 minutes or until the potatoes are just tender. Add the peas and coconut milk, if you’re using it, and cook just another minute. Remove the bay leaf and add salt and pepper to taste. Nutrition information does not include the optional coconut milk. Note from Amy: The leftovers are fabulous the next day! Thanks Mary Ellen! It’s very easy and flavorful! I thought I was the cookbook queen, but I haven’t heard of this one! I think I’m going to have to check it out, because this recipe looks amazing! Thanks Dianne! It’s a great book! Yes, I know we both love chickpeas! I want to eat this curry again already! Curry is my jam, and always coconut milk. This looks delicious! Yes! The coconut milk takes it to another level. I love this book and have been cooking so many of the recipes from it because they are all so quick and easy. This is one I haven’t tried though. I have no idea why as I love chickpeas in curry. I’ll have to try it next! I love this book, too! There are so many recipes I can’t wait to try. I love chickpea curry! This looks like a great recipe! Thanks Kate! It’s really delicious! This sounds so wonderful, especially in the cooler months to come! Looks amazing! As the weather turns cooler, I know I’ll be craving hot, comfort heathy foods! Thank you! I just made this again this week. It’s definitely becoming one of our favorite recipes! Hello.. I did chickpea curry recipe and it was easy and delicious! Thank you! Thank you, Silvia! I’m happy you enjoyed it. How much coconut milk do you add if you want to use it!! One can of coconut milk. I highly recommend adding it! This was the first curry I made and it was deliciou!. Next time I will use 1 1/2 cans of coconut milk. I’m so happy your enjoyed it, Rachael! I’ve been on the hunt for an easy, delicious chickpea curry recipe with coconut and this one jumped out at me, so I made it yesterday. IT’S AWESOME! For my version I omitted the oil and cauliflower but it wasn’t missed when it came to the taste. Fire roasted tomatoes and extra vegetable stock were added. Also, I threw in some bell pepper and carrots. It was so delicious that my husband tried it and LIKED IT – which makes it a keeper and a new favorite! We had it again tonight with some rice and a salad. It was even better the next day and now it’s GONE BABY. I highly recommend this recipe to anyone looking for a nutritious, delicious and easy meal. Thank you! That’s wonderful to hear, Mary Ann! Thank you for sharing your version, too! This looks delish, I would like too add cauliflower and potatoe and freeze for Xmas eve ? Thanks Linda! You can freeze it, but don’t add the coconut milk (if using) until you reheat it. Enjoy! 1) There are just the 2 of us, can I freeze the leftovers? 2) Also, how big are the servings? 3) We are not fans of chickpeas, can I sub the chickpeas with Northern Beans? Thanks Donna! I hope you enjoy it! 1) Yes, you can freeze the leftovers. 2) The servings really aren’t that big, in my opinion. I think you could refrigerate or freeze the leftovers and have enough for a couple more meals. 3) Sure, you can use a different bean, or leave the beans out and add more vegetables.